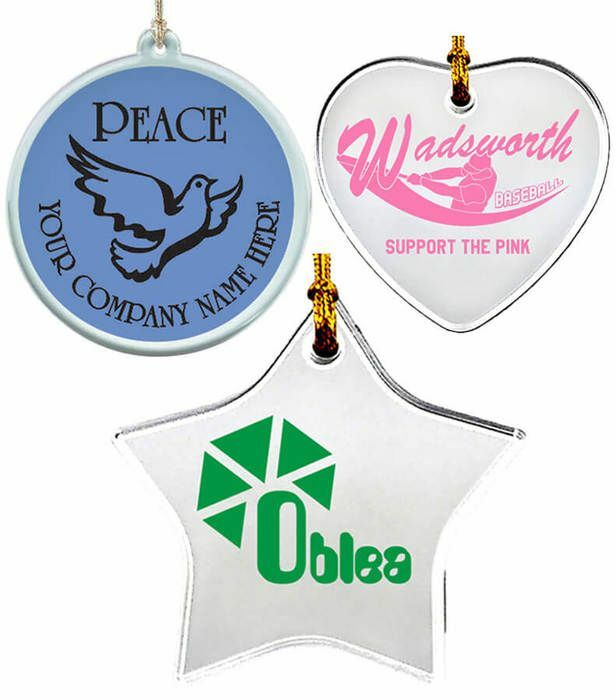 Clear acrylic sun catchers are a great and cost effective promotion. Easy to display with foil hang cord.You can also get our pretty organza bags or elegant gift boxes. Can be pre-inserted into organza bags or gift boxes if requested in any order comments box. Ornament Designs 8 stock designs available - Ribbon, Snow Flake, Hanukkah, Thank You, Peace, Season's Greetings, Star, Clear. You can mix and match the stock designs in the same order, but your artwork and layout must be exactly the same on your entire order. If using your own custom design, you can mix round, heart, and star ornaments, but due to differing imprint areas between round, star, and heart ornaments, the smallest imprint area will be used for all ornaments if you are mixing the ornament shapes within the same order. Imprint Area Round: 2.5" diameter; Heart & Star: 1.5" diameter. Full color print: Full bleed, 1/4" bleed room required. Imprint areas only apply to sun catchers without stock designs. Setup Charge $20.00 per ink/per color. 2 side imprint max. $25.00 Full Color print. We gave them to our staff for a little memento and Christmas present. They loved them! I received them and they are SOOOO much better than what I expected! Thank you! I can't wait to give them to my dancers!